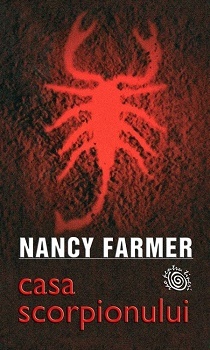 I’m not really into Science Fiction, but I really enjoyed reading ‘The House of the Scorpion’, written by Nancy Farmer. I have to admit, when I first put my hands on it, I didn’t know what it was about. But the title got me intrigued. So I started reading it, and soon I discovered a story about good and evil and the struggle to survive as a single individual. And, I must say, it took my breath away! The story takes place in Opium, “The Dream Country”, run by Matteo Alacran – also known as “El Patrón” – an incredibly powerful drug lord who is over 140 years old. He plans to live eight lives, in honor of his dead brothers, and in order to do so, he raises clones for organ transplants. Unlike others, El Patron takes care of his clones. He lets them grow up, he doesn’t destroy their brains, and offers them the childhood that he and his brothers never had. Yet, the end is always the same. The clones must be sacrificed. Matt, the main character, is the ninth clone of El Patron. The first 14 years of his life are a real „adventure”. He is haunted by local superstitions like the Mourner or the Chupacabra (goat-sucker), but he enjoys every moment, every breeze or perfume. He learns quickly and hopes that one day, he’ll be able to exceed his clone status – something evil and soulless – and win others’ respect with his intelligence. When he finds out that he is only another clone, an organ donor for El Patron, he suffers a great disillusion. His savior becomes his executioner. Good and evil get mixed up in a strange way. And when he’s saved by his nanny, Celia, he starts a new adventure. Beyond the story are all those amazing but also disturbing descriptions – the white poppy field, the smell of rain on grass, the „eejits” camp with the terrible and deadly smell, the Valley of Bones. At one point, I was under the impression the author was trying to create a parallel between two worlds – one about life, the other about death. But everything turned out to be an illusion. 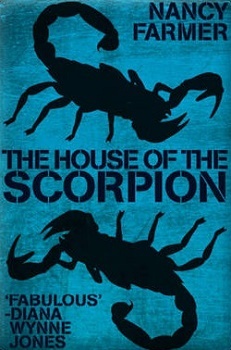 The House of the Scorpion reminded me of One Hundred Years of Solitude by Gabriel Garcia Marquez, The Island of Doctor Moreau by H.G. Wells or Never Let Me Go by Kazuo Ishiguro. If you liked at least one of these books, I think you’ll like Nancy Farmer’s book, too. There’s something about it that makes you tremble, and all those questions start to haunt you. It’s a wonderful book, trust me! PS. I’ve just found out that this book is followed by The Lord of Opium, which continues Matt’s story. I’ll put it on my wish list.